Marissa Meyer (The Lunar Chronicles, Heartless) is back with a story of superheroes and villains—a vividly imagined world where those with extraordinary abilities fall into distinct camps governed by rules and singular intention. 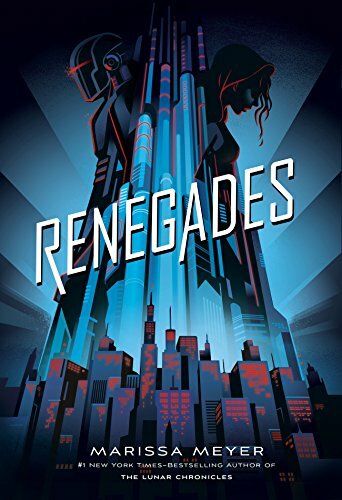 The Renegades, the heroes of this universe, are prodigies whose powers are used to protect society, called to help those in need. The Anarchists—the villains—are a largely defunct group of subverters who were defeated years ago in an infamous battle for control of a crumbling society. Now living in tunnels, their determination to destroy the Renegades comes to a head with a brazen assassination attempt by one of their own—Nightmare. Nova has reason to hate the group of hailed heroes. For years she’s chiseled her anger and grief into a weapon she intends to use to enact her revenge. Because Nova knows more than anyone that the Renegades aren’t everything they’re cracked up to be. But when Nova finally gets close to her enemy, she meets Adrian—a Renegade who is good, who believes in justice, who relishes in solving problems for those who need it the most. Before too long, lines get blurred and Nova must remember the side she’s on, remember that she has the power to destroy the very people who destroyed her own life. Meyer explores the superhero trope with skill, delving into the many shades of gray between good and bad, between malice and morality. Tension and suspense ratchet as the narrative unfurls, especially as romance begins to bloom between two star-crossed lovers. There’s more to come in the series, especially after a surprise ending that is sure to change the story’s trajectory. I, for one, can’t wait to see what happens.